Below is the full text of Jeremy Corbyn’s response to Theresa May’s latest Brexit statement, in which she confirmed the meaningful vote would be delayed. Mr Speaker, we are in an extremely serious and unprecedented situation… the government has lost control of events and is in complete disarray. It has been evident for weeks that the Prime Minister’s deal did not have the confidence of the House, yet she ploughed on regardless, reiterating “this is the only deal available”. Can she be clear with the House is she seeking changes to the deal, or mere reassurances? Does she therefore accept the statement from the European Commission at lunchtime saying it was the “only deal possible, we will not renegotiate, our position has not changed”? Ireland’s Taoiseach Leo Varadkar has said “it is not possible” to renegotiate the Irish border backstop – stating that it was the Prime Minister’s own red lines that made the backstop necessary. So can the Prime Minister be clear, is she now ready to drop further red lines in order to make progress? Mr Speaker, can the Prime Minister confirm that the deal presented to this House is not off the table but will be re-presented with a few assurances. Bringing back this same botched deal either next week or in January – and can she be clear on the timing? – will not change its fundamental flaws and the deeply held objections right across this House, which go far wider than the backstop alone. This is a bad deal for Britain, a bad deal for our economy and a bad deal for our democracy. Our country deserves better than this. The deal damages our economy, and it isn’t just the Opposition saying that, the Government’s own analysis shows this deal would make us worse off. If the Prime Minister cannot be clear that she can and will re-negotiate a deal then she must make way. And if she is going back to Brussels, then she needs to build consensus in this House. And since it appears business has changed for the next two days, then it seems not only possible, but necessary, that this House debates the negotiating mandate that the Prime Minister takes to Brussels. 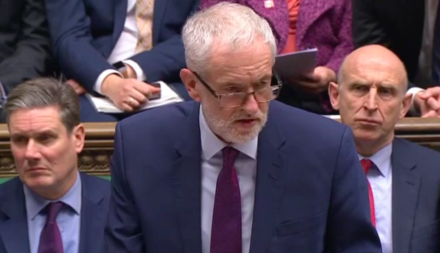 There is no point – no point at all – in this Prime Minister bringing back the same deal again which clearly does not command the support of this House. Mr Speaker, we have endured two years of shambolic negotiations. Red lines have been boldly announced and then cast aside, we are now on the third Brexit Secretary and it appears each one of them has been excluded from vital stages of the negotiations. We were promised a precise and substantive document and got a vague 26 page wish-list. And they have become the first government in British history to be held in contempt. And the fault for that lies solely at the door of this shambolic government. This Prime Minister is trying to buy herself one last chance to save this deal. If she doesn’t take on board the fundamental changes required, she must make way for those who can.